What is Credit Valuation Adjustment (CVA)? 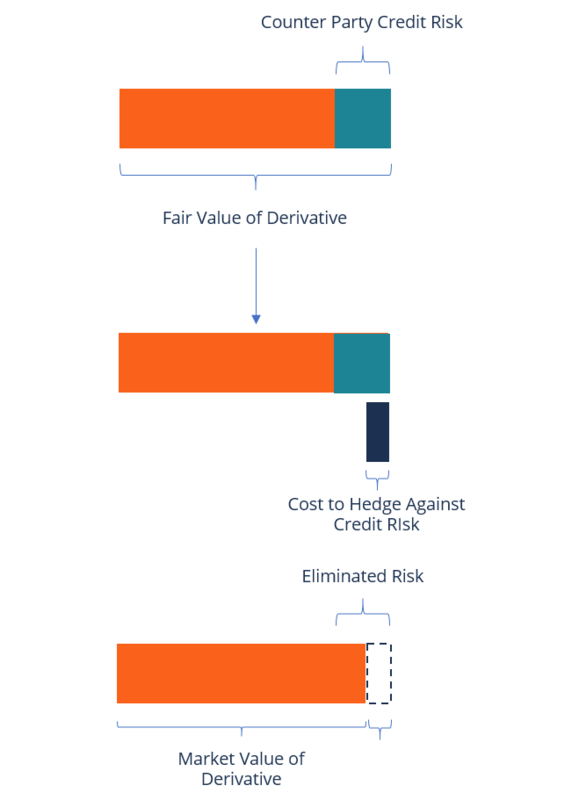 Credit Valuation Adjustment (CVA) is the price that an investor would pay to hedge the counterparty credit risk of a derivative instrumentDerivativesDerivatives are financial contracts whose value is linked to the value of an underlying asset. They are complex financial instruments that are used for various purposes, including hedging and getting access to additional assets or markets.. It reduces the mark to market value of an asset by the value of the CVA. Credit Valuation Adjustment was introduced as a new requirement for fair value accounting during the 2007/08 Global Financial Crisis. Since its introduction, it has attracted dozens of derivatives market participants, and most of them have incorporated CVA in deal pricing. The concept of credit risk management, which includes credit valuation adjustment, was developed due to the increased number of country and corporate defaults and financial falloutsTop Accounting ScandalsThe last two decades saw some of the worst accounting scandals in history. Billions of dollars were lost as a result of these financial disasters. In this article, we look at the 10 biggest accounting scandals in recent times. Many of these scandals were a result of the excessive greed of the. In recent times, there have been cases of sovereign entity defaults, such as Argentina (2001) and Russia (1998). At the same time, a high number of large companies collapsed before, during, and after the financial crisis of 2007/08, including WorldCom, Lehman Brothers, and Enron. Initially, research in credit riskCredit RiskCredit risk involves managing the creditworthiness of all entities a firm lends to, including bondholders. Credit risk is the risk of loss that may occur from the failure of any party to abide by the terms and conditions of any financial contract, principally the failure to make required payments on loans focused on the identification of such a risk. Specifically, the focus was on counterparty credit risk, which refers to the risk that a counterparty may default on its financial obligations. Prior to the 2008 financial crisis, market participants treated large derivative counterparties as too big to fail and, therefore, never considered their counterparty credit risk. The risk was often ignored due to the high credit rating of counterparties and the small size of derivative exposures. The assumption was that the counterparties could not default on their financial obligations like other parties. However, during the 2008 financial crisis, the market experienced dozens of corporate collapses, including large derivative counterparties. As a result, market participants started incorporating credit valuation adjustment when calculating the value of over-the-counterOver-the-Counter (OTC)Over-the-counter (OTC) is the trading of securities between two counter-parties executed outside of formal exchanges and without the supervision of an exchange regulator. OTC trading is done in over-the-counter markets (a decentralized place with no physical location), through dealer networks. derivative instruments. Derivative instruments can be classified as either unilateral or bilateral, depending on the nature of the payoff. For a unilateral derivative instrument holder, exposure to loss occurs if a counterparty defaults on their financial obligations. The amount of loss that an investor incurs is equal to the fair value of the instrument at the time of default. Bilateral derivatives are more complex than unilateral derivatives, since the former includes two-way counterparty risk. This means that both the counterparty and the investor are exposed to counterparty risk. The advantage of bilateral derivatives is that the derivative may adopt an asset or liability position at any valuation date. For example, if Counterparty A is at a positive asset position today, it is exposed to Counterparty B. If A defaults on his obligation, he will owe the positive asset to B. The same applies if B is in a negative liability position because, in case of default, he owes the negative liability position to A. There are several methods that are used to value derivatives, and they vary from simple to advanced methodologies. Determining the credit valuation adjustment method to use depends on the organization’s sophistication and resources available to the market participants. The simple method calculates the mark to market value of the instrument. The calculation is then repeated to adjust the discount rates by the counterparty’s credit spread. Calculate the difference between the two resulting values to obtain the credit valuation adjustment. The swaption-type is a more complex credit valuation adjustment methodology that requires advanced knowledge of derivative valuations and access to specific market data. It uses the counterparty credit spread to estimate the replacement value of the asset. This involves the simulation of market risk factors and risk factor scenarios. The derivatives are then revalued using multiple simulation scenarios. The expected exposure profile of each counterparty is determined by aggregating the resulting matrix. Each counterparty’s expected exposure profile is adjusted to derive the collateralized expected exposure profile. Credit Default Swap (CDS)Credit Default SwapA Credit Default Swap (CDS) is an agreement that protects the buyer against default. Swaps work like an insurance policy where a buyer can buy protection against an unlikely event that may affect the investment.